Fumarolic activity, concentrated at the foot of the lava dome, continued at a constant level. The temperature of the hot lake in the same area had not changed, but varied within the lake from 34 to 84°C. The temperature of the stream that flowed from the lake remained at 30-34°. The Global Volcanism Program has no Weekly Reports available for Tomariyama [Golovnin]. During a 6 November aerial survey, moderate fumarolic and solfataric activity was noted at the N foot of the E and W domes and along Goryachee Lake's S shore. Tomariyama, also known as Golovnin, forms the southern end of Kunashir Island, across the Nemuro Strait from Hokkaido. Explosive activity has dominated in the formation of this andesitic-dacitic volcano; no lava flows are exposed. The gently sloping stratovolcano, is truncated by a 4-5 km wide caldera that formed during a series of late-Pleistocene eruptions beginning about 43,00 years ago. Several lava domes were subsequently emplaced on the caldera floor. Topographic highs outside the caldera rim define a series of lava domes extruded along a ring structure or an outer caldera. A 1 x 2.5 km caldera lake on the northern side of the inner caldera drains through a narrow breach in the western caldera wall. Solfataric activity occurs at the northern lake shore and at explosion craters (one of which contains a hot crater lake with reported temperatures from 36-100 degrees C) that cut the caldera-floor lava domes. The only known historical eruption was a minor explosion in 1848. Raszhigaeva N G, Korokty A M, Sulerzhitsky L D, Grebennikova T A, Ganzei L A, Bazarova V B, 1999. Late Pleistocene tephra around Golovnin volcano, Kunashir I. (Kuril Islands). Volc Seism, 20: 127-254 (English translation). Raszhigaeva N G, Korotky A M, Sulerzhitsky L D, Grebennikova T A, Ganzei L A, Mokhova L M, Bazarova V B, 1998. Holocene tephra of Kunashir I. (Kuril Islands). Volc Seism, 20: 48-63 (English translation). There is no Deformation History data available for Tomariyama [Golovnin]. There is no Emissions History data available for Tomariyama [Golovnin]. 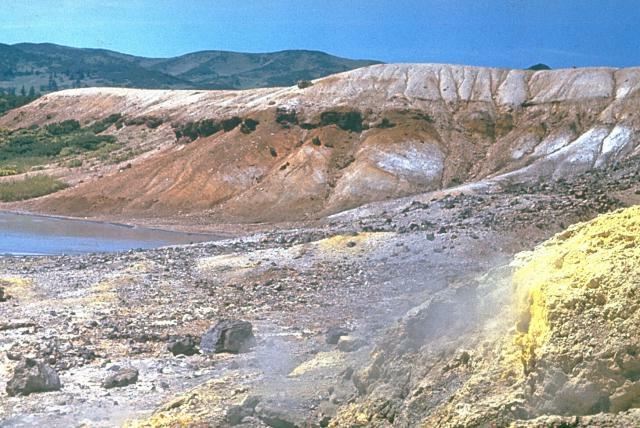 An explosion crater on the floor of Golovnin caldera contains sulfur-encrusted fumarolic areas along the lake shore and beneath the lake, giving rise to its name, Kipyashchoe (Boiling Lake). Golovnin volcano, the southernmost in the Kuril Islands, forms the southern end of Kunashir Island, across the Nemuro Strait from Hokkaido. The gently sloping stratovolcano is truncated by a 4-5 km wide caldera with several lava domes on its floor. The only known historical eruption of Golovnin was an explosion in 1848. There are no samples for Tomariyama [Golovnin] in the Smithsonian's NMNH Department of Mineral Sciences Rock and Ore collection. Large Eruptions of Tomariyama [Golovnin] Information about large Quaternary eruptions (VEI >= 4) is cataloged in the Large Magnitude Explosive Volcanic Eruptions (LaMEVE) database of the Volcano Global Risk Identification and Analysis Project (VOGRIPA).